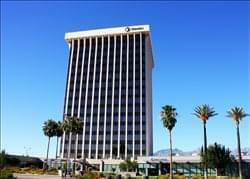 Find My Workspace lists over 95% of the executive office suites market in Tucson. Simply click Request Quote to check pricing for one office, or Add to Basket for multiple offices. This center is well known, easy to find, and conveniently located. This building comes equipped with free parking, that also includes an abundance of space to accommodate employees and their guests. Secured covered parking provides protection for vehicles. This location includes an onsite gym, making it convenient for employees to be active. In the office, 3 different size conference rooms are available for use. Our local staff is also able to become a member of your team to answer your phones, set appointments, and help you close more business! Amazing mountain and city views make this an ideal location.